The problem of increasing the value of cashew nuts from Vietnam | HANG XANH INTERNATIONAL Co., Ltd.
VCN- Besides increasing domestic cashew nuts production to reduce the dependence on imported raw materials, the cashew nuts industry of Vietnam is also trying to increase the value for cashews, along with committing 100% of the products to ensure food safety. According to the Ministry of Agriculture and Rural Development, in the first 10 months of 2016, domestic cashew enterprises in the country had imported 913,000 tons of raw cashew nuts, worth $US 1.4 billion, an increase of 17% in volume and 39% in value compared to the same period of 2015. In which, most imported cashews are from Africa. It is forecasted that in this year, the import of cashew raw materials of Vietnam can be up to 1 million tons (if including the imports from Cambodia), accounting for 65% of the volume of domestic cashew processing. The heavy reliance on imported materials may lead to some difficulties in quality and food safety control. Mr. Bach Khanh Nhut, Deputy Director of VinaControl Company - the inspection authority of most of the raw cashew nuts imported into Vietnam, assessed that the quality of cashew nuts imported from Africa was unstable in general, when arriving in Vietnam, the products are often damp, moldy, etc., so the rate of damaged goods is often high. The providers often blame bad weather conditions, heavy rain or high air humidity, however, according to Mr. Nhut, the main cause is that the progress of harvesting, processing and storage of raw cashew nuts. Some problems in delivery, such as lack of volume, not free of impurities or damaged packaging still exist, which are affecting the reputation of the exporters of raw cashew nuts from Africa and the finance of the importers. Also, according to Mr. Nguyen Duc Thanh - Chairman of the Vietnam Cashew Association (Vinacas), many sellers did not fully perform the contract, not deliver the goods for Vietnam enterprises or still deliver but require a subsidy, there are cases when the goods have arrived to our seaport and the payment documents have been sent to the bank, but the sellers could edit the bill of lading and deliver the goods to other customers with higher prices. According to Mr. Nhut, humidity is the decisive factor in the preservation and storage of raw cashew nuts, directly affects the color and the taste of cashew nuts after processing. Better control of humidity will enhance the commercial value of the cashew nuts, and the nutritional content will mostly unchanged, the portion of burnt or yellow kernels is reduced, and after processing, the cashew nuts still remain the natural color and special flavor of the product, contributing significantly to the production chain of clean and safe cashews. Conversely, cashew nuts with high humidity will create favorable conditions for mould to grow, which is a threat creating the toxin Aflatoxin in the kernel and becoming unsafe for consumers. Therefore, all kinds of cashews with heavy moisture, germination or being rotten cannot be put into processing, they must be treated differently or burnt. This causes a great losses for businesses. In addition to the losses in volume (from 2 to 4%, even discarding the shipment), the importers also suffered the losses in terms of quality, reducing goods worth by about $US 0.6/LB (1 pound equivalent to 0,45kg) for exported processed cashew kernels. At that point, the plan of producing and exporting of Vietnam cashew processing enterprises would be affected and lead to violate the delivery contracts with the partners. From that adversity, it would affect the reputation and brand of Vietnam cashew nuts. 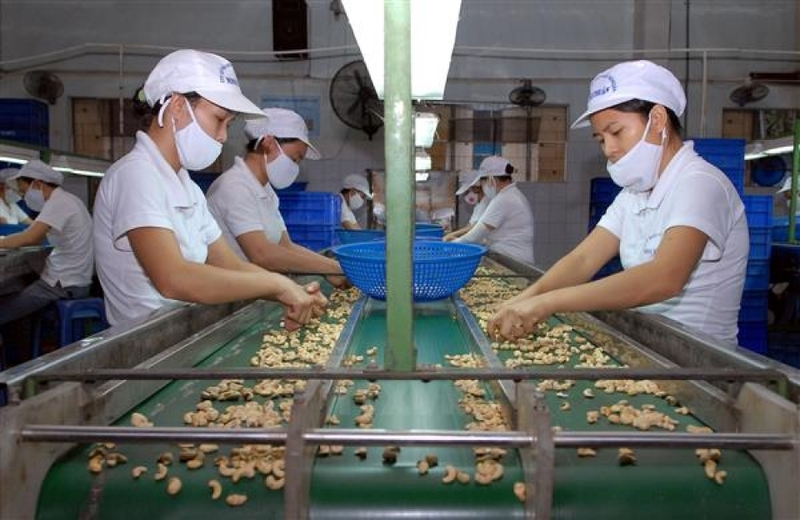 Faced with the heavy reliance on imported raw materials, while their qualities are uncertain, Mr. Nguyen Duc Thanh, Chairman of Vinacas said that in the period of 2016-2020, the Vietnam cashew industry will prioritize the development of 4 projects. Firstly, the cashew production and business enterprises will accompany farmers on the project "Cashew improvement transplant and intensive farming". Accordingly, the target is that by 2020, the harvested cashew production of Vietnam will reach 600,000 tons of raw cashew nuts, a significant increase compared to 2016. Secondly, the project "Cleaner production" with the goal of providing high-quality and food safety product line to the market. Vinacas is encouraging enterprises to restructure their models and upgrade the plants towards the international standard ISO - HACCP - BRC - FSSC 22000 - SA 8000, etc. Vinacas is also encouraging businesses to coordinate with the farm owners, clubs or cooperatives to produce clean and organic cashews. Accordingly, Vinacas committed that, from the beginning of 2016, 100% of Vinacas members’ products ensure food safety. Recently, Vinacas, along with the Cashew production and business enterprises club, has also issued a statement of quality with 5 No and 3 Yes. In particular, 5 No are: not using aromatherapy during processing; no genetically modified products; no mould; no infections or insects and not using forced labor. 3 Yes are: the product has natural color; characteristic taste and high nutritional value. The third core project deployed by Vinacas is increasing the economic value of cashew trees through the schemes of the industry. In particular, deep processing and diversification of product lines need to be promoted. Along with that, Vinacas also promotes the domestic consumption demand with the target that in 2020, the domestic consumption demand will be about 30,000 tons, double compared to the 2015 figure of 15,000 tonnes. In addition, Vinacas is also building the brand for Vietnam cashew nuts and encouraging the enterprises to participate in the program to build the national brand. Accordingly, Vinacas has collaborated with many agencies to research and promote the nutritional value of cashew nuts from Binh Phuoc, Dong Nai, etc. The result is that domestic consumption in 2015 increased by 100% over with 2014. Finally, Vinacas is pushing trade and export promotion projects. For the last 10 years, Vietnam has been ranked No.1 in the world in the export of cashew kernels. "We are proud that when the world today think about cashews, they will think about Vietnam. But in the future, we will strive to achieve that when people talk about clean cashews, they will talk about Vietnam "- Mr. Thanh affirmed. According to the Ministry of Agriculture and Rural Development, in the first 10 months of 2016, the volume of exported cashew kernels in Vietnam reached 291,000 tons, export turnover reached $US 2.33 billion, an increase of nearly 6% in volume and 3% in value compared to the same period of 2015. It is forecasted that in 2016, the cashew exports of Vietnam will reach $US 2.7 billion, including $US 2.5 billion of cashew kernels - the highest ever. With this result, in 2016, Vietnam will continue to maintain a market share of over 50% of the global cashew trade (about $US 5.5 billion). 2016 is also the 11th consecutive year that the Vietnam cashew industry holds a leading position in the export of cashew kernels.